2000-02-01 First worldwide family litigation filed litigation Critical https://patents.darts-ip.com/?family=23376404&utm_source=google_patent&utm_medium=platform_link&utm_campaign=public_patent_search&patent=EP0796084(B1) "Global patent litigation dataset” by Darts-ip is licensed under a Creative Commons Attribution 4.0 International License. The present invention relates to personal skin moisturizing and cleansing compositions. Moisturizers are usually applied directly to the skin as leave-on products. Personal cleansing products are usually applied with water as a foam or lather and rinsed off with clear water. Ideal rinse off personal cleansers should cleans the skin gently, causing little or no irritation without defatting and or drying the skin and without leaving skin taut after frequent use. Most lathering personal cleansing products, bar soaps, liquids and syndet liquids fail in this respect. Some current commercial personal cleansing liquids claim to "moisturize" the skin. But, most of these current cleansing liquid products do not deliver an adequate moisturizing benefit. Therefore, users typically must moisturize their skin with a separate leave-on product following cleansing. It would be highly desirable to improve the delivery of skin moisturizers from a cleansing liquid composition over the current commercial personal cleansing liquids. If this were accomplished it would provide users with the convenience of obtaining both a cleansing and a moisturizing benefit from a single product. Dual cleansing and lipid moisturizing liquid compositions are very difficult to formulate and process. One reason is the cleaning ingredients, in general, tend to be incompatible with the lipid moisturizing ingredients. Another problem is processing on a commercial scale. Yet another problem is getting the lipid in the liquid to deposit on the skin of the user. The deposition of lipid moisturizer from the liquid, onto the skin can be very low due to loss of the lipid in the wash and the rinse. Conversely, it can feel too sticky if deposited on the skin. Still another problem is formulating a dual liquid that lathers well. Another problem is formulating a dual liquid that is storage stable. The actual deposition of lipid moisturizer from a lathering dual liquid composition is essential for effective lipid benefit. No known commercial prior art liquid that claims to be a cleansing and lipid moisturizing liquid, deposits as much 3 micrograms of lipid moisturizer per cm. sq. of washed skin. U.S Pat. No. 3,829,563, Barry et al., issued Aug. 13, 1974, discloses an emollient cleansing composition containing 10-70% by weight petrolatum with up to 98%, preferably, 95-98%, having a diameter particle size smaller than 5 microns. U.S. Pat. No. 5,308,526, Dias et.al., issued May 3, 1994, incorporated herein by reference, discloses liquid skin compositions with up to 5% petrolatum wherein 20-80% of said petrolatum particles have a particle size from 10-120 microns. U.S. Pat. No. 5,312,559, Kacher et al., issued May 17, 1994, incorporated herein by reference, discloses semi-solid compositions of 60,000 to 400,00 cps containing 0.5% to 15% petrolatum having a particle size distribution in which 20% to 80% of the particles are 10 -120 microns. It is an object of the present invention to provide an effective, yet gentle, dual skin cleansing liquid composition which actually deposit enough lipid on the skin to provide superior skin moisturizing and sensory benefits while maintaining its lathering and cleaning properties. The liquid of the present invention can provide good cleansing, lather and good sensory feel and yet surprisingly provide a lipid moisturizing benefit via deposition of the lipid on the skin of the user. The liquid composition is stable and on a macro scale is homogeneous. The dual cleansing and lipid moisturizing liquid composition of this invention comprises: (1) about 5 parts to about 30 parts of a lipid skin moisturizing agent; (2) about 1 to about 15 parts of an ethylene glycol fatty acid ester; (3) from about 0.05 parts to about 3 parts of a selected water dispersible gel forming polymer (4) from about 5 parts to about 30 parts of a lathering synthetic surfactant, and; (5) water, and wherein said synthetic surfactant and any soap has a combined CMC equilibrium surface tension value of from 15 to 50, and wherein said lathering skin cleansing liquid composition has a Lipid Deposition Value (LDV) of from about 5 to about 1000 µg of lipid per sq. cm of skin.. The present invention can provide a dual cleansing and lipid moisturizing liquid composition: 1) which produces an abundant, stable, high quality lather, 2) which is an effective skin cleanser, 3) which is very mild to the skin and ocular mucosae, 4) which actually delivers an effective amount of a lipid moisturizing agent to the skin of the user during the wash; 5) which is non-sticky after use, and 6) which is storage stable. wherein said synthetic surfactant and any soap has a combined CMC equilibrium surface tension value of from 15 to 50, and wherein said lathering skin cleansing liquid composition has a Lipid Deposition Value (LDV) of from about 5 to about 1000 µg of lipid per sq. cm of skin. The term "Oil in Water Emulsion Stabilizer" as used herein, is defined as an ingredient that helps to prevents the oil or lipid from separating in a cleanser's neat form while allowing lipid to be released to deposit on the skin wend used in bath or shower, some examples of such stabilizers are: crystalline ethylene glycol fatty acid ester, water dispersible gel forming polymer or a combination of this ester and a water dispersible gel forming polymer. The term "Shelf Stable Liquid Cleanser," as need herein, is defined as a neat lathering skin cleansing liquid composition that under ambient conditions does not phase separate for at least two weeks, preferably for at least six months, and more preferable never. The term "Lipid Release", as used herein, means that a lipid in a liquid emulsion cleanser will release or separate from the emulsion upon dilution to lather concentrations. Such a liquid cleanser will provide improved lipid deposition. The term "Water Dispersible Gel Forming Polymer" as used herein means that the polymer is water dispersible and forms a gel in water of the liquid cleanser at 5 to 40° C.
Vaughan Solubility Parameter (VSP) is a calculated parameter used to define a lipid's solubility. Vaughan parameters typically have a range of 5-25. Lipid Deposition Value (LDV) is a measure of how much lipid is deposited on skin from compositions herein, the reading corresponds to the amount measured using a Sebumeter (typically the mean of four-six readings), as defined in Lipid Deposition Protocol 1, herein. Equilibrium Surface Tension is a measure of surface tension of a surfactant as measured at the critical micelle concentration at 25°C; units are dynes/cm. Consistency, k, is a measure of lipid viscosity, used in combination with Shear index, to define viscosity for materials whose viscosity is a function of shear. The measurements are made at 35°C and the units are poise (equal to 100 cps). Shear index, n, is a measure of lipid viscosity, used in combination with Consistency, to define viscosity for materials whose viscosity is a function of shear. The measurements are made at 35°C and the units are dimensionless. Elastic Modulus G' is used to define rheological properties of lipid and is a measurement of a lipids ability to store or return energy. The measurements are made at 35°C and the units are dynes/sq. cm. Viscous Modulus G'' is used to define rheological properties of lipid and is a measurement of unrecoverable energy. The measurements are made at 35°C and the units are dynes/sq. cm. All parts, percentages and ratios used herein are by weight basis and all measurements are at 25°C, unless otherwise indicated. One liquid cleanser oil inwWater emulsion stabilizer, of this invention is a crystalline ethylene glycol fatty acid ester. This stabilizer is not a surfactant. This crystalline stabilizer provides a stable liquid cleanser with larger lipid particles. This stabilizer provides improved shelf stability but allows the lipid in water emulsion to separate upon dilution to a lather concentration and thereby provide for increased lipid deposition onto the skin. The non-surfactant oil in water emulsification network comprises crystals of C10-C22 ethylene glycol fatty acid ester. The ethylene glycol fatty acid ester comprises from 1 part to 15 parts, preferably from 1 part to 10 parts, more preferably from 3 parts to about 8 parts of the liquid. The ester is preferably a diester, more preferably C14-C18 diester, most preferably, Ethylene Glycol Distearate. While not being bound by theory, it is believed that the ester form an insoluble particle network, preferably platelet crystals, that prevent the coalescence of lipid particles, thus preventing phase separation of the product. This network breaks down on dilution in the lather, resulting in emulsion instability in the lather and deposition of lipid on skin. The above selected oil in water stabilizer of present invention is used in combination with another selected oil in water stabilizer of this invention. The other stabilizer is a water dispersible gel forming polymer. This polymer is preferably an anionic, nonionic, cationic or hydrophobically modified polymers, selected from the group consisting of cationic polysaccharides of the cationic guar gum class with molecular weights of 1,000 to 3,000,000, anionic, cationic and nonionic homopolymers derived from acrylic and/or methacrylic acid, anionic, cationic and nonionic cellulose resins; cationic copolymers of dimethyldialkylammonium chloride and acrylic acid; cationic homopolymers of dimethyldialkylammonium chloride; cationic polyalkylene and ethoxypolyalkylene imines polyethylene glycol of molecular weight from 100,00 to 4,000,000; and mixes thereof. Preferably, the polymer is selected form the group consisting of Sodium Polyacrylate, Hydroxy Ethyl Cellulose, Cetyl Hydroxy Ethyl Cellulose, and Polyquaternium 10. Preferred compositions include form 1 parts to 15 parts C10-C22 ethylene glycol fatty acid esters and 0.1 parts to 3 or 5 parts, more preferably 0.3 parts to 3 parts, polymer gel former. Some compositions have from 0.3 parts to 5 parts, more preferably 0.8 parts to 3 parts, water dispersible gel forming polymer. In the product that contains no ethylene glycol fatty acid esters, 0.3 parts to 3 parts water dispersible gel forming polymer, preferably chosen from the group consisting of Sodium Polyacrylate, Hydroxy Ethyl Cellulose, Cetyl Hydroxy Ethyl Cellulose, and Polyquaternium 10, and from 0.5 parts to 6 parts from the group consisting of C10-C18 fatty alcohol, oleyl alcohol, C10-C18 fatty acid, and oleyl acid, and mixtures thereof. Most preferably, these liquid compositions contain from 1.0 parts to 5.0 parts selected from C16, C18, and Oleyl alcohol, or myristic acid; and mixtures thereof. The water dispersible gel forming polymer can also improve the sensory feel of the lipid on skin in addition to product stabilization. The improved sensory results from reduced tackiness and greasiness and improved smoothness. It is an especially preferred embodiment to use mixture of polymers, some of which are preferred for product stabilization, some are preferred for improved sensory. Preferred polymers to improve sensory are selected from the following group consisting: of polyethylene glycol, hydroxypropyl guar, guar hydroxypropyltrimonium chloride, polyquaternary 3, 5, 6, 7, 10, 11 and 24 and mixes thereof. Polymers that do not form gels with water are optional and are not used by themselves or to stabilize the liquid composition of this invention. The following test is used to determine whether or not some lipid in a lipid in water liquid cleanser product will be "released" or separate as a lipid phase. A twenty percent (20%) solution of the neat liquid cleanser is made by weighing 5 grams of neat liquid product into a 100 ml beaker and adding 20 grams of 75-78 F (22-24 C) tap water of hardness 7-8. It is stirred for 3 minutes on a magnetic stirplate with a 1 1/2" (3.75 cm.) stir bar at a medium setting with a good vortex. The stirred sample is poured into a graduated cylinder (preferably 10 ml) and observed for 1 Hour at room temperature. Preferred compositions show phase separation during this time period, with a clear layer at or near the bottom, indicative of the lighter lipid phase separating to the top. Less preferred compositions take longer to separate. No known commercially available prior art liquid cleanser that contains a lipid has a measurable separation during the 1 hour period, when subjected to the above test. While not being bound to any theory, the probable reason for this is that those prior art liquids are over emulsified with surfactant and/or non-crystalline emulsifiers. The lipid skin moisturizing agent in the liquid composition provides the skin of the user with a moisturization benefit via deposition of the lipid on skin during use. In this invention the lipid skin moisturizing agent is defined with scrutiny. The lipid type and its physical properties in this present invention hold the key to the overall product effectiveness, and is restricted to a hydrophobic material with the following defined physical and rheological properties. The lipid in this present invention is further defined by its solubility parameter, as defined by Vaughan in Cosmetics and Toiletries, Vol. 103, p47-69, Oct. 1988. A lipid having a Vaughan Solubility Parameter Value (VSP) of from 5 to 10, preferably 5.5 to 9 , more preferably where at least 70% of said lipid has a VSP of 6.5 to 7.75 for use in the liquid compositions herein. Fatty acids, fatty acid soaps and water soluble polyols are specifically excluded from our definition of a lipid. Thus stearic acid, glycerine and propylene glycol are excluded from our definition of a lipid. Notwithstanding the rheological and solubility requirements, a wide variety of lipid type materials and mixtures of materials are suitable for use in the compositions of the present invention. Preferably, the lipid is selected from the group consisting of hydrocarbons oils and waxes, silicones, fatty acid derivatives, cholesterol, cholesterol derivatives, di and tri-glycerides, vegetable oils, vegetable oil derivatives, and acetoglyceride esters, alkyl esters, alkenyl esters, lanolin and its derivatives, milk -tri-glycerides, wax esters, beeswax derivatives, sterols and phospholipids mixtures thereof. Hydrocarbon oils and waxes: Some examples are petrolatum, mineral oil micro-crystalline waxes, polyalkenes, paraffins, cerasin, ozokerite, polyethylene and perhydrosqualene. Silicone Oils: Some examples are dimethicone copolyol, dimethylpolysiloxane, diethylpolysiloxane, high molecular weight dimethicone, mixed C1-C30 alkyl polysiloxane, phenyl dimethicone, dimethiconol, and mixtures thereof. More preferred are non-volatile silicones selected from dimethicone, dimethiconol, mixed C1-C30 alkyl polysiloxane, and mixtures thereof. Nonlimiting examples of silicones useful herein are described in U.S. Patent No. 5,011,681, to Ciotti et al., issued April 30, 1991, which is incorporated by reference. Di and tri-glycerides: Some examples are castor oil, soy bean oil, derivatized soybean oils such as maleated soy bean oil, safflower oil, cotton seed oil, corn oil, walnut oil, peanut oil, olive oil, cod liver oil, almond oil, avocado oil, palm oil and sesame oil, vegetable oils and vegetable oil derivatives; coconut oil and derivatized coconut oil, cottonseed oil and derivatized cottonseed oil, jojoba oil, cocoa butter, and the like. Milk glycerides are useful and an example is hydroxylated milk glyceride. Polyol fatty acid polyesters are also useful. Wax esters, such as beeswax and beeswax derivatives, spermaceti, myristyl myristate, stearyl stearate are also useful. Vegetable waxes are useful and some examples are carnauba and candelilla waxes. Sterols are useful and some examples are cholesterol, cholesterol fatty acid esters. Phospholipids, such as lecithin and derivatives, Sphingo lipids, ceramides, glycosphingo lipids are also useful. It is more preferred when at least 70 % of the lipid is selected from the group consisting: petrolatum, mineral oil micro-crystalline waxes, paraffins, ozokerite, polyethylene, hydrogenated polybutene, polydecene and perhydrosqualene, dimethicones, cyclomethicones, alkyl siloxanes, polymethylsiloxanes and methylphenylpolysiloxanes, and mixture thereof. It is most preferred when at least 75 % of lipid is composed of lipids selected from the group consisting: petrolatum, mineral oil, hydrogenated polybutene, and polydecene, and mixtures thereof, and wherein the ratio of petrolatum to the other selected lipids (hydrogenated polybutene or polydecene or mineral oil) is from about 10:1 to about 1:3, more preferably from about 5:1 to about 1:1. The lipid is preferably in the liquid as an emulsion having droplets ranging from about 0.1 microns to 100 microns, excluding anomalous very small or a few very large particles. Preferably greater than 25% of the lipid particles are from 5 microns to 120 microns and more preferably at least 40% of the lipid particles are from about 5 microns to 20 microns. An especially preferred particle size range is from 15% to 35% of particles having a particle size of 0.1 to 5 micron, 15 to 45% having a particle size of between 5 and 10 microns, from 30% to 50% having a particle size between 10 and 15 micron, and less than 15% having a particle size greater than 15 micron. It is a surprising aspect that high levels of large particle lipid can be stable in a liquid cleansing composition and also deposit efficacious levels in the washing process. While not being bound by theory, larger particles typically deposit more efficiently than smaller particles. While not being bound by any theory, lipids outside of the rheology properties defined herein below are either too easily emulsified and hence will not deposit, or are too "stiff" to adhere or deposit on to skin and provide a moisturization benefit. The lipid rheological properties are considered to have an important effect on lipid deposition. In addition, the rheological properties of the lipid are also important to user perception. Some lipids, on deposition to the skin, are considered too sticky and are not preferred by the user. Two types of rheological parameters are used to define the lipid used herein. The viscosity of the fluid is represented by consistency (k) and shear index (n) and, while not being bound by any theory, is believed to represent the stickiness. The other type of parameter used herein, are the elastic modulus (G') and the viscous modulus (G''). While not being bound by any theory it is believed G' and G'' are important factors determining the lipid's emulsification characteristics. The shear index, n, and consistency, k, are well accepted industry standards for reporting the viscosity profile of a material that has a viscosity that is a function of the shear rate. For all materials the viscosity, which is defined for instance in "Chemical Engineering, by Coulson and Richardson" is given by: Viscosity, µ = σ/γ' Where σ is the shear stress, and γ' is the shear rate. The viscosity for all materials is measured by either applying a shear rate and measuring the resultant shear stress or vice versa. Note that mineral oil, microcrystalline wax and some other lipids by themselves have geological properties that are unsuitable for use in the present liquid compositions; but may be blended with other lipids to provide acceptable lipid blends. The elastic modulus G' is a measure of a materials ability to store recoverable energy. This energy storage can be the result of the ability of a complex polymer, structural network, or a combination of these to recover stored energy after a deformation. The viscous or loss modulus G'' is a measure of the unrecoverable energy which has been lost due to viscous flow. The lipid is present in the liquid at a level of from about 5 parts to about 30 parts by weight of the liquid. Its more preferred levels are 10 parts to 25 parts. 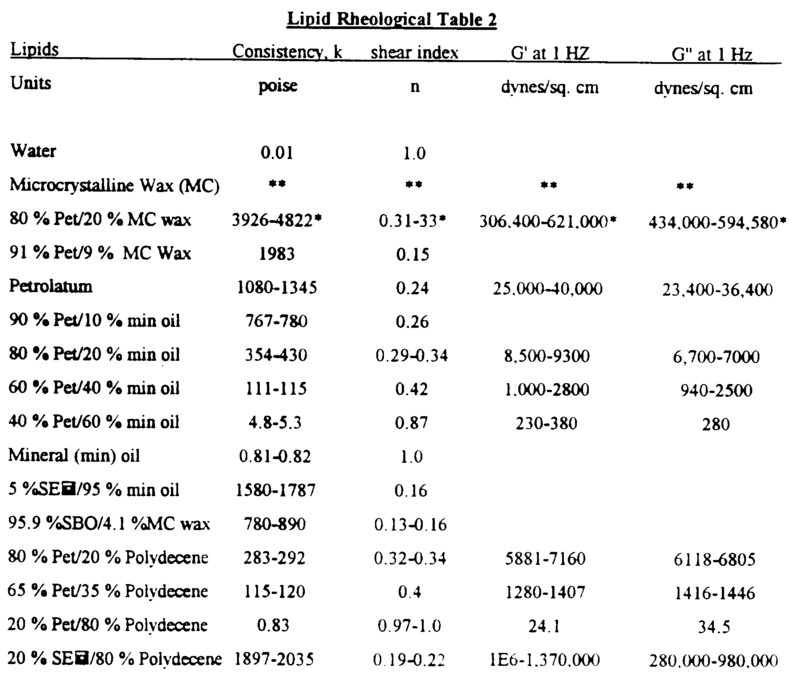 Known market liquids that contain lipid deposit lipid at an efficiency of less than 3 microgram per sq. cm. of skin as measured by Deposition Protocol 1. The lipid in this present invention is deposited on skin during use at an efficiency that produces at least 5 µg of lipid per sq. cm of skin. The preferred level of deposition is from about 10 µg/sq. cm to about 500 µg/sq. cm. The more preferred levels are from 15 or 25 µg/sq. cm to about 200 µg/sq. cm , as measured by lipid Deposition Protocol 1. It has been found that a certain minimum level of lipid is required in order to get any measurable deposition of the lipid on skin. While not being bound by theory, known market liquids that contain liquid almost exclusively rely on emulsification of lipid by surfactant to provide product stability of the resultant emulsion. However, this also results in stability of the emulsion when the product is diluted to form the lather, resulting in very poor deposition efficiency. It is an aspect of the current invention that the emulsion is stabilized in the product by non-surfactant means as well. The resultant emulsion tends to phase separate in the lather, resulting in excellent deposition of lipid on the skin. The level of lipid deposition on skin can be measured by different protocols, all are modeled after how skin cleansing products are typically used by consumers. All the protocols are "in vivo", and all tests are made using a statistically designed protocol using at least 6 subjects per prototype. All protocols consist of a common product application stage followed by a determination of the deposited lipid amount. The following two protocols only differ in the analytical technique used to quantify the amount of deposited lipid on the skin. The quantification of lipid is "in vivo" and as such has a wide variance due to differences in skin type and condition. To offset this a balanced design is used to test prototypes; balanced in skin type and using a large base size. In all cases product application and measurement is undertaken by a trained technician to reduce variability. The subject wets the entire surface of the inner forearm with 95-100F tap water. The technician, using an implement known as a "puff", applies 1 ml of product to the pre-wet pouf. The technician then rubs the pouf with a constant pressure and speed for 30 seconds (i.e., exactly 30 rubs up and 30 rubs down). The lather is allowed to remain on the forearm for fifteen seconds, followed by a thorough rinse for fifteen seconds with the water flowing from inner elbow to wrist. The subject arm is then pat dried with a paper towel. The subject then waves the arm to "air" dry for 30 seconds. The unit used is a Sebumeter SM810 which is commercially available from Courage and Khazaka GmbH and is reported to be recognized by the scientific world. The Sebumeter measures lipid on the skin via photometry of a special plastic strip, which becomes transparent when it absorbs lipids. The plastic strip is extended over a mirror which is connected to a spring. The measuring head of the device (comprised of spring, mirror and plastic strip) is pressed against the skin for 30 seconds. The value (µg/sq. cm) is indicative of the amount of lipid on the skin, and increases with increased amount of lipid. The method is insensitive to humidity. Sebumeter readings (4-6) are taken along the length of the forearm and the Lipid Deposition Value, LDV, (µ g/sq. cm) is defined as the mean of the 4-6 readings, divided by 0.56 for petrolatum containing lipid mixtures. The 0.56 value is a conversion factor to translate sebumeter readings with petrolatum containing lipids to actual deposition levels in µg/sq. cm. Lipid deposition values of from 15 to 200 ug/sq. cm., more preferably from 30 to 150 ug/sq. cm. are preferred. 1. The Sebumeter tape also detects natural skin lipids. A criterion of this test was that subjects baseline value measured on the Sebumeter, prior to washing, be less than or equal to 1 or 2 µg/sq. cm of forearm skin. 2. The Sebumeter like other surface extraction measurements may not measure all the deposited lipid, if the skin topography is undulating it is possible that deposited lipid may not be extracted by the Sebumeter tape. 3. The Sebumeter tape becomes saturated at a LDV of above about 300 µg/sq. cm; so it is understood that for deposition values above 300 µg/sq. cm, Protocol 2 is used. 4. Different lipid systems will have different conversion factors. For testing non-petrolatum lipids, a new calibration curve is required. The second protocol uses a solvent extraction method similar in type to that described in the Journal Society of Cosmetic Chemists of Great Britain Vol. 21 (p 521-532), 1970. An extraction cup is firmly attached to the forearm and heptane poured in to the cup, such that it is in contact with the forearm. The solvent extract containing the extracted lipid is analyzed by standard gas chromatographic methods. The liquid composition comprises a lathering synthetic surfactant selected from the group consisting of anionic surfactants; nonionic surfactants, cationic surfactants, amphoteric surfactants, and mixtures thereof. The lathering synthetic surfactant is defined herein as a synthetic surfactant or mixes thereof that when combined have an equilibrium surface tension of between 15 and 50 dynes/cm, more preferably between 25 and 40 dynes/cm as measured at the CMC (critical micelle concentration) at 25°C. Some surfactant mixes can have a surface tension lower than those of its individual components. The combined personal cleansing and moisturizing liquid composition herein comprises at least from about 5 part to about 30 parts, preferably from about 5 parts to about 25 parts, and most preferably from about 10 parts to about 25 parts of a lathering synthetic surfactant. Amphoteric synthetic surfactants cannot serve as the sole surfactant in this product, but are preferred as a co-surfactant at a lower level of from about 1 part to about 10 parts, by weight and the more preferred types are selected from alkyl-ampho mono- and di-acetates, alkyl betaines, alkyl dimethyl amine oxides, alkyl sultaines, alkyl amidopropyl betaines, alkyl amidopropyl hydroxysultaines, and mixtures thereof, wherein said surfactants contain C8 to C22 alkyl chains. Nonionic synthetic surfactant cannot serve as the sole surfactant in this product, but can be used as a co-surfactant at a lower level of from about 1 parts to about 15 parts , by weight. The more preferred types selected from the group consisting: alkyl glucose amides, alkyl glucose esters, polyoxyethylene amides, fatty alkane amides, alkyl amine oxides, alkyl polyglucosides, polyoxy ethylene alkyl phenols, polyoxyethylene esters of fatty acids, EO/PO block co-polymers such as polyoxamines and poloxamers, sorbitan esters and alcohol esters, and mixtures thereof. A preferred embodiment is liquid compositions containing from 0.5 parts to 8 parts C8-C14 soap; where the soap has a counterion selected from the group consisting of K and N(CH2CH2OH)3, and mixtures thereof, in addition to the synthetic lathering surfactant. Cationic synthetic surfactant cannot serve as the sole surfactant in this product, but are preferred as a co-surfactant at a lower level of from about 0.5 parts to about 6 parts, by weight. The more preferred types of cationic surfactants are selected from the group consisting: alkyl trimonium chloride and methosulfate, and dialkyldimonium chloride and methyl sulphate, and alkyl alkonium chloride and methyl sulphate and mixtures thereof. These surfactants contain C12 to C24 carbon atoms per alkyl chain. The most preferred cationic is selected from the group consisting of stearalkonium chloride, stearyltrimonium chloride, Di-stearyl-dimonium chloride, and mixtures thereof. Cationic surfactants may also act as a lipid deposition aid. The moisturizing and cleansing liquid compositions of the present invention comprise water as an essential component. The water is present at a level of from about 30 parts to about 80 parts, preferably from about 40 parts to about 75 parts, and most preferably from about 40 to about 65 parts. A substantial percentage of the water forms the key part of an aqueous phase, which may also contain other water soluble components. Polyols and surfactants are water soluble. While not being bound to any theory, the presence of a lipid in water emulsion is believed to be important to lipid deposition on the skin. The level of water is key to forming a lipid in water emulsion. Thus, an effective amount of water is required to form an aqueous phase to support the lipid in water emulsion. The level of aqueous phase to lipid is preferably greater than 2:1, more preferably greater than 3:1. The upper range of water is adjusted to provide a desired liquid viscosity and liquid composition stability. Also enough water is required to properly process the liquid, so the lower amount of water is restricted by an ability to dispense the composition. where R1 = H, C1-C4 alkyl; R2 = H, CH3 and n = 1 - 200; C2-C10 alkane diols; guanidine; glycolic acid and glycolate salts (e.g. ammonium and quaternary alkyl ammonium); lactic acid and lactate salts (e.g. ammonium and quaternary alkyl ammonium); polyhydroxy alcohols such as sorbitol, glycerol, hexanetriol, propylene glycol, hexylene glycol and the like; polyethylene glycol; sugars and starches; sugar and starch derivatives (e.g. alkoxylated glucose); panthenol (including D-, L-, and the D,L- forms); pyrrolidone carboxylic acid; hyaluronic acid; lactamide monoethanolamine; acetamide monoethanolamine; urea; and ethanol amines of the general structure (HOCH2CH2)xNHy where x = 1-3; y = 0-2, and x+y = 3, and mixtures thereof. The most preferred polyols are selected from the group consisting of glycerine, polyoxypropylene(1) glycerol and polyoxypropylene(3) glycerol, sorbitol, butylene glycol, propylene glycol, sucrose, urea and triethanol amine. Preferred water soluble organic material is preferred when elected from the group consisting of glycerine, polyoxypropylene (1) glycerol and polyoxypropylene (3) glycerol, sorbitol, butylene glycol, propylene glycol, sucrose, and urea and triethanolamine. The use of oil thickening polymers, such as those listed in EP 0 547 897 A2 to Hewitt, published 23/06/93, incorporated herein by reference, are useful if the final rheology of lipid and polymer falls within the preferred range. A preferred optional ingredient are one or more cationic and/or nonionic polymeric skin conditioning agents. A variety of polymers can be employed and can be present at a level of from about 0.1 parts to about 10 parts, and more preferably 0.25 parts to about 3 parts of a polymeric, nonionic, cationic or hydrophobically modified polymeric skin feel aid, selected from the group consisting of cationic polysaccharides of the cationic guar grim class with molecular weights of 1,000 to 3,000,000, cationic and nonionic homopolymers derived from acrylic and/or methacrylic acid, cationic and nonionic cellulose resins; cationic copolymers of dimethyldialkylammonium chloride and acrylic acid; cationic homopolymers of dimethyldialkylammonium chloride; cationic polyalkylene and ethoxypolyalkylene imines; and mixes thereof. Examples are hydroxypropyl guar, guar hydroxypropyltrimonium chloride, polyquaternary 3, 5, 6, 7, 10, 11 and 24. In order to achieve the benefits described in this invention, the polymer must have characteristics, either structural or physical which allow it to be suitably and fully hydrated and subsequently well incorporated into the soap matrix. A variety of additional ingredients can be incorporated into the compositions of the present invention. These materials including, but not limited to, liquid appearance aids, salts and their hydrates, clays, and other "filler materials" are listed in U.S. Patent 5,340,492, to Kacher et al., issued August 23, 1994, and U.S. Patent No. 4,919,934, to Deckner et al., issued April 24, 1990; which is incorporated herein by reference. Other non limiting examples of these additional ingredients include vitamins and derivatives thereof (e.g., ascorbic acid, vitamin E, tocopheryl acetate, and the like); sunscreens; thickening agents (e.g., polyol alkoxy, ester, available as Crothix from Croda); preservatives for maintaining the anti microbial integrity of the compositions; anti-acne medicaments (resorcinol, salicylic acid, and the like); antioxidants; skin soothing and healing agents such as aloe vera extract, allantoin and the like; chelators and sequestrants; and agents suitable for aesthetic purposes such as fragrances, essential oils, skin sensates, pigments, pearlescent agents (e.g., mica and titanium dioxide), lakes, colorings, and the like (e.g., clove oil, menthol, camphor, eucalyptus oil, and eugenol). As described above, the liquid dual composition of this invention can provide good cleansing and foaming and yet moisturize the skin via lipid deposition. The liquid composition of this invention itself has a Lipid Deposition Value (LDV) of at least 5 micrograms per sq. cm. This means that it will deposit at least 5 micrograms of lipid on a sq. cm of forearm skin using Lipid Deposition Protocol 1 disclosed herein. While not being bound to any theory, the presence of an unstable lipid in water emulsion in the lather is believed to be key to deposition of lipid on the skin during the wash cycle. 1. Thickeners such as Carbopols, are added to a portion of the distilled water at room temperature and allowed to mix, hydrate for about 20 minutes or until mixture is thickened. 2. Distilled water, fatty acid flakes, Glycerin and Ethylene Glycol Distearate are heated together to 165-175F (73-80° C). 3. If potassium soap is part of the composition, a caustic solution (45% active Potassium Hydroxide) is added and the mixture is stirred at a medium speed for 10-15 minutes until mixture is homogeous. 4. The synthetic surfactants are added (amphoteric, cationic and anionic) and temperature is allowed to cool by addition of ingredients to about 140F (60° C), maintaining good mixing. 5. Polymer is added in one of several ways, depending on type. If the polymer is polyquaternium 10, it is premixed with one-half the amount of mineral oil or hydrogenated polybutene and added as a premix, mixed 5 minutes before continuing. Alternatively, Polyquaternium 10 is premixied with water and allowed to stir for 10-20 minutes to allow hydration of the polymer. If the polymer is polyox; it is added dry very slowly to the mix and allowed to stir until dispersed smoothly. 6. Any additional sensory aids such as silicones are added and allowed to mix 1-2 minutes. 7. A premix of lipid blend, (e.g. hydrogenated polybutene or mineral oil with petrolatum), at a temperature of 105-110° F (40-43° C), is added to the mixture at a temperature of 110-115° F (43-46° C) and allowed to stir for 2 minutes at a slow to medium setting. The duration and intensity of the mixing after lipid addition is considered important, especially with regards to particle site. Accordingly, if mixed too long or too fast, particle size and the resultant lipid deposition decreases. 8. The perfume is added and the batch is adjusted for water loss by weighing and back adding the amount lost due to evaporation during batch making. 1. A portion of the available surfactants (25-50%) is added to a portion of the available water (20% - 50%), heated to 160° F (71° C), and agitated for about 20 minutes or until the surfactants are dissolved. Various (or multiples) types of surfactants (amphoteric, nonionic, cationic and anionic) are used in order to create a mixed surfactant system that maximizes Ethylene Glycol Distearate (EGDS) solubilization. The surfactant concentration is also important for this reason low water levels are used. However, high surfactant concentration negatively affects the crystallization of EGDS. Therefore a balance needs to be found between solubility and crystallization of EGDS. It is preferred to add surfactant in an order of addition according to the following: amphoteric, nonionic, anionic and cationic. 2. EGDS is added to the heated surfactant blend and allowed to dissolve and mix for about 20 to 30 minutes. Optical microscopy techniques are used to determine the time when maximum EGDS solubilization (approximately 60%) is achieved. 3. The EGDS dispersion is fast cooled using a plate and frame heat exchanger to a temperature of about 110° F to 80° F (43° C to 27° C) to form elongated EGDS crystals. The optimum freeze-out temperature is determined from the cooling curve of a DSC spectrum. Prior to passing through the heat exchanger, the temperature is maintained at 145-160° F (63-71° C) to reduce the formation of EGDS agglomerates that affect the quality of the EGDS crystals and reduce the stability of the final product. 4. In a separate vessel, the remaining water is used to dissolve and hydrate cationic polymers such as Polyquaternium 10, Merquat 550, or Jaguar. The polymer is added to cold water at medium to low agitation. 5. The solvent or any other water soluble organics such as Glycerine is added to the polymer solution to further dilute and thin the polymer solution. 6. Fatty acid flakes and Tetra Sodium EDTA are added and mixed for about 10 minutes and then heated to 160 to 170° F (71 to 77° C). 7. A caustic solution (45% active Potassium Hydroxide) is added and the mixture is agitated at a medium to high speed for 10-15 minutes until mixture is homogenous. 8. The temperature is reduced to about 120° F (49° C) with an in-line shell and tube heat exchanger. The remaining surfactants are added and the mixture..
9. When the temperature of the blend is between 110 to 90°F (45 to 32° C) the EGDS premix is added to this blend and allowed to mix for about 10 to 20 minutes. 10. Acrylates (e.g. Carbopol, Salcare) and cellulose (e.g. Bermocoll) type thickeners, sensory modifiers such as polyox, and perfumes are added and mix for about 10 minutes. 11. Any additional sensory aids such as silicones are added and allowed to mix 1-2 minutes. 12. A premix of lipid blend, either hydrogenated polybutene or mineral oil with petrolatum, at a temperature of 105-110°F (40-44° C), is mixed continuously with the surfactant/EGDS/Polymer mixture under controlled shear stress conditions (e.g. using a static mixer). The lipids premix can also be added to the mixture and mix in an agitated vessel as long as the applied shear and mix time are kept to a minimum. In both cases duration and intensity of the shear applied to the system considered important because both affect lipid deposition. The hand wash lather test is used to provide in-use lather volume measurements for the lather performance of skin cleansing liquids. The test measures the lather volume generated under a soil load. Synthetic soil is used for the test reported herein. Its formula is reported in US 4,673,525 to Small et al. issued June 16th 1987, incorporated herein by reference. The technician washes hands first with Ivory bar before starting test. The technician rubs 0.2mls of synthetic soil into the dry palm of the hands. The technician then passes one hand through 95F city water, leaving a little water in palm of hand and dispenses 1.7 mls of test product into that hand. The technician then passes the other hand through the water and spreads product by rubbing palms together. The product is circulated on the palm and fingers of the hand 3 times then over the back of the hands once. This procedure is repeated continually 5 times. The technician gathers and scrapes the product off the hands and into a 250 ml beaker. A "flash" non soil volume grade is assigned based on the volume in the beaker. Alternatively, a lather grade is assigned to the amount and character of lather, based on a set of standards. The same basic procedure is followed for "Ultimate" volume except that before the product is gathered and scraped into a beaker, an additional 2 mls of water is added to the hands and the product is again spread through the hands and circulated as outlined above continuously 5 more times, then the product is gathered/scraped into a 250 ml beaker and graded based on volume. Alternatively, a lather grade is assigned to the amount and character of lather, based on a set of standards. Examples D, E, F, and G are preferred examples demonstrating a wide range of deposition and different ratios of petrolatum/mineral oil and petrolatum/polybutene. These formulas also have different sensory profiles. They result in a wide range of sensory attributes, from heavy to light moisturization, appealing to different set of consumers. Examples D, E, F and G are all shelf stable and have at least 40% of particles larger than 5 micron, and are not stable on dilution, bases on the Lipid in Water Emulsion Stability Test. In contrast, a currently marketed product which contains a mixture of lipids, Oil of Olay Shower Gel, does not separate on dilution in one hour. Examples H, I, and J have high levels of deposition with different lipid mixtures. Example H has a 4:1 Petroltum/Mineral oil ratio, Example I has a 4:1 Petrolatum/Polybutene ratio, and Example J has a 4:1:0.9 Petrolatum/Polybutene/Dimethicone ratio. Examples H & I appear to be the best liquid compositions of this invention. Examples K, L, M, and N are all shelf stable, have good deposition, and have good lather, while providing different skin feel because of different skin feel polymers. Examples K and L contain Polyquaternium 7 and examples M and N contain Polyethylene Glycol (MW 400,000 ). Sodium Sulfate is added to L and Isobutylene/Maleic Anhydride Copolymer is added to N to thicken the products. wherein said synthetic surfactant and said soap has a combined CMC equilibrium surface tension value of from 15 to 50, and wherein said lathering skin cleansing liquid composition has a Lipid Deposition Value (LDV) of from 5 to 1000 µg of lipid per sq. cm of skin. wherein said synthetic surfactant and soap has a combined critical micelle concentration (CMC) equilibrium surface tension value of from 25 to 40 dynes per cm at 25°C; and said water is from 30 parts to 80 parts water. The lathering skin cleansing liquid composition according to Claim 1 wherein said water is present at a higher level than said lipid; and wherein said water level is from 40 to 75 parts; and wherein said water and said lipid form a lipid in water emulsion; and wherein said emulsion is shelf stable, but is an unstable lipid in water emulsion when subjected to the Lipid Release Test. The lathering skin cleansing liquid composition according to Claim 2 wherein said synthetic surfactant parts is from 5 to 25 parts, and wherein said synthetic surfactant is selected from the group consisting: acyl isethionates, acyl sarcosinates, alkylglycerylether sulfonates, acyl lactylate, methylacyl taurates, paraffin sulfonates, linear alkyl benzene sulfonates, N-acyl glutamates, alkyl sulfosuccinates, alpha sulfo fatty acid esters, alkyl ether carboxylates, alkyl phosphate esters, ethoxylated alkyl phosphate esters,, alpha olefin sulphates, the alkyl ether sulfates (with 1 to 12 ethoxy groups), and mixtures thereof, wherein said surfactants contain C8 to C22 alkyl chains and wherein the counterion is selected from the group consisting of : Na, K, NH4, N(CH2CH2OH)3. The skin cleansing liquid composition according to Claim 4, wherein said composition contains from 0.5 parts to 8 parts C8-C14 soap; said soap having a counterion selected from the group consisting of K and N(CH2CH2OH)3, and mixtures thereof. The lathering skin cleansing liquid composition according to Claim 5 wherein said water is 40 to 65 parts; wherein said synthetic surfactant parts is from 10 to 25 parts, by weight; and wherein said synthetic surfactant is further selected from group (1) consisting of sodium lauryl and coco isethionate, sodium lauryl and coco sarcosinates, sodium C12-C16 sulfosuccinates, sodium C12-16 alkylglycerylether sulfonates, sodium lauryl and coco taurates, sodium lauryl lactylate, sodium laureth sulfate, sodium lauryl sulfate, ammonium laureth sulfate, ammonium lauryl sulfate; and from group (2) consisting of: lauryl and coco betaines, lauryl and coco hydroxy sultaines, and mixtures thereof; and wherein the ratio of said group (1) and group (2) is from 1:1 to 30:1; and wherein said LDV is from 15 to 250. The lathering skin cleansing liquid composition according to Claim 2 wherein said synthetic surfactant parts comprises from 1 to 15 parts of a nonionic lathering synthetic surfactant selected from the group consisting: alkyl glucose amides, alkyl glucose esters, polyoxyethylene amides, fatty alkane amides, alkyl amine oxides, alkyl polyglucosides, polyoxy ethylene alkyl phenols, polyoxyethylene esters of fatty acids, EO/PO block co-polymers such as polyoxamines and poloxamers, sorbitan esters and alcohol esters, and mixtures thereof. where R1 = H, C1-C4 alkyl; R2 = H, CH3 and n = 1 - 200; C2-C10 alkane diols; guanidine; glycolic acid and glycolate salts (e.g. ammonium and quaternary alkyl ammonium); lactic acid and lactate salts (e.g., ammonium and quaternary alkyl ammonium); polyhydroxy alcohols such as sorbitol, glycerol, hexanetriol, propylene glycol, hexylene glycol and the like; polyethylene glycol; sugars and starches; sugar and starch derivatives (e.g. alkoxylated glucose); panthenol (including D-, L-, and the D, L- forms); pyrrolidone carboxylic acid; hyaluronic acid; lactamide monoethanolamine; acetamide monoethanolamine; urea; and ethanol amines of the general structure (HOCH2CH2)xNHy where x = 1-3; y = 0-2, and x+y = 3, and mixtures thereof; and wherein said water soluble organic material at least 50 % soluble in water. The lathering skin cleansing liquid composition according to Claim 2 wherein said polymer is from 0.25 parts to 3 parts, by weight, selected from the following group consisting: of polyethylene glycol, hydroxypropyl guar, guar hydroxypropyltrimonium chloride, polyquaternary 3, 5, 6, 7, 10, 11 and 24 and mixes thereof. The lathering skin cleansing liquid composition according to Claim 1, wherein said lipid has an elastic modulus (G') measured at 1Hz and 35°C in the range 25 to 100,000 dynes/sq. cm and has an viscous modulus (G'') measured at 1Hz and 35°C in the range 25 to 500,000 dynes/ sq. cm. NL145278B (en) * 1966-04-06 1975-03-17 Nebraska State Method for the implementation of a transesterification reaction between a liquid polyhydric alcohol and a hydrophobic ester of a long chain fatty acid.